The first thing I saw upon arriving at the Pokémon World Championships was a sign politely informing fans that the event was closed to the public. The second thing I saw was a store. Up the stars from the main entrance was a makeshift Pokémon Center loaded with custom San Francisco-themed merchandise, including a trolley conductor Pikachu. 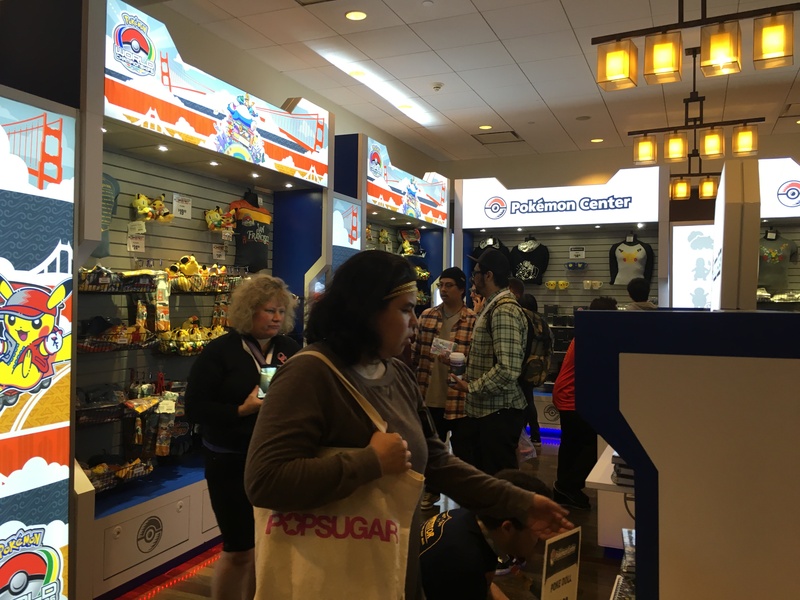 The Pokémon Company International wasn't about to let the masses into the tournament proper, but they were more than happy to sell them plush toys and other souvenirs. And as you might expect, the store was packed. Just outside, a handful of fans who lacked badges sat around an empty foyer with TVs showing the matches. Most were playing various versions of the game, others had large binders full of trading cards. On the various television, the Pokken Tournament bracket was finishing up so that it could make way for the main event - the finals for the TCG and video game championships. They weren't shy about trying to get at the event downstairs. Spying my media badge, one fan sat next to me and asked if I had picked up the special Charmander that was being given out at the event, then hinted that he really wanted me to take his 3DS downstairs so he could get one. He wasn't the only one, either. While many relaxed in the foyer, a few made their way toward the escalators to catch a glimpse of the competitors. The inner sanctum lay below - past a horde of security guards and several steep escalators. Soon I headed down toward my first Pokémon World Championship, uncertain what I would find. My decision to head to the Pokémon World Championship was made on the spur of the moment. A few days before the event was set to kickoff, I received an email from my PR contact reminding me to check out the streams, which in turn reminded me that the tournament was being held just a few miles from where I lived. I was able to get hold of a press badge in relatively short order, but I almost didn't go. I'd long had mixed feelings about the Pokémon World Championships, which officially added the video games in 2009. I was dismayed when Game Freak and The Pokémon Company decided to make doubles the official tournament metagame, effectively forcing me to learn an entirely new competitive game. That decision led to a split in the community at large, with some favoring the traditional singles game, and others embracing the VGC format. Also, as an adherent to the rather strict set of rules put forth by Smogon - one of the Internet's most popular competitive sites - I was annoyed by the number of unrestricted legendary Pokémon that were often allowed in the various tournaments (rules shift on an annual basis). It felt wrong to allow such overpowered monsters in official play given that they were more trophies than anything. The net effect was that everyone used these legendaries, which resulted in a lot of teams that looked pretty much the same. True, that was the case with the Smogon tiers as well, but it felt like there was a little more wiggle room to be creative with lower-powered Pokémon. And there was also the elephant in the room: I was a bit older than Pokémon's target demographic, to say the least. It felt odd knowing that I'd be participating in a tournament loaded with young children and teenagers, even if I'd be in the older Master Division bracket. I was self-conscious enough about going to a Toys 'R Us for the sake of picking up a legendary Pokémon. My opinion of the Video Game Championships began to turn around 2014, when Se Jun Park won the tournament with a Pachirisu - a tiny squirrel Pokémon better known for its cuteness than its prowess in battle. It looked incredibly out of place standing next to the likes of Salamence, Tyranitar, and Garchomp, but its surprise bulkiness and moves like Super Fang and Follow Me made it an impressive team player. I was stunned by Park's creativity, and it made me reconsider my stand on doubles and the tournament atlarge. Still, I was apprehensive was I rode down the escalator. As familiar and comfortable as I was with Pokémon, I felt like I was entering a different world - one that I had left behind. 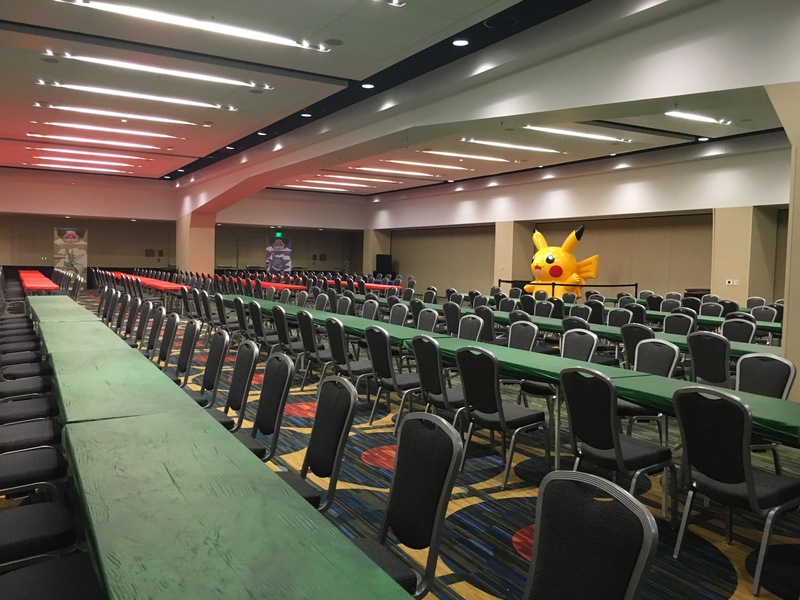 Heading into the bowels of the Pokémon Industrial Complex, the first thing I saw was a massive conference room with rows and rows of tables and empty chairs. At the front of the room was a Pikachu statue that seemed to look down upon the room like a cheerful but nevertheless sinister god. I quickly moved on. Pokken Tournament filled the next room. Though ostensibly an equal part of the event, it had been set aside in a smaller conference room to make room for the TCG and the main videogame. A small crowd sat watching a large video screen in the middle of the room while stragglers sat playing on the smaller monitors lining the room. The main event was still one more floor down, and so I headed there with my PR contact to at last see the Pokémon World Championships for myself. Tagged with 3DS Handhelds,	Articles,	Game Freak,	Nintendo,	Pokemon,	Pokemon Alpha Sapphire,	Pokemon Omega Ruby,	pokemon-world-championships,	The Pokemon Company.